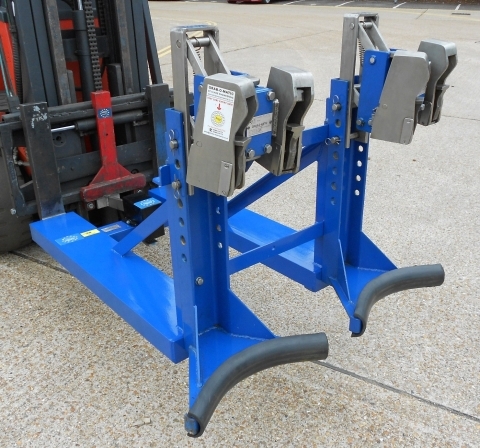 The Grab-O-Matic Twin Head Double Drum Handler model QR-2-DTLR-P Semi St/Steel is suitable for all steel open top and tight head drums, plastic ‘L’ ring drums and most fibre board drums and is secured to the forks with the Quick Attach/Release System. 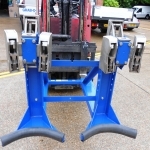 The unique ‘twin head’ gripping heads are designed to spread the load on very heavy drums or light gauge steel or plastic drums and prevent damage to the top rim, the Quick Attach/Release System allows the fork truck driver to securely attach and release the units from the forks without the need to dismount from the truck, the QR system increases safety and productivity. The QR-2-DTLR-P main frame is manufactured from powder coated steel with stainless steel packers on the base of the frame and rubber fenders on the base of the pillar drum supports, fitted with 2 x Grab-O-Matic HD-4 Twin Head gripping heads that are manufactured completely from stainless steel including all internal parts, springs, gripping jaws etc, the unit is suitable for use in an ATEX spark proof area. 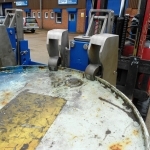 The heads grab the drums securely on the top rim, a mixture of steel and plastic drums can be grabbed at the same time or just a single drum, damaged drums and drums of various sizes and diameters can be safely and efficiently grabbed with the 2-DTLR-P Semi St/Steel double drum handler. The twin heads are suitable for steel open top and tight head and plastic L-ring drums. The twin heads spread the load on very heavy or light gauge drums. 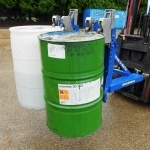 The rubber fenders protect the drums and the pillars from sparking.